We are a MagnaCharger supercharger dealer. Supercharging can significantly improve your vehicles performance, without the lag associated with turbo setups. Click here for answers to frequently asked questions about supercharging your vehicle with MagnaCharger. MagnaCharger not available for your vehicle? Click here for other supercharging options. 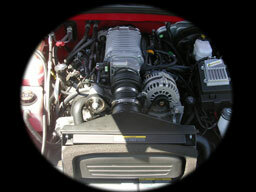 We have been building custom performance engines for over twenty-six years. We have your engine performance needs covered on everything from performance rebuilds to completely custom motor swaps. Click here to find out more about our engine performance solutions. If you want to get some more performance from your vehicle, but aren't ready or don't need to go with wild modifications, you should look into bolt-on performance solutions. We have you covered on everything from cold air intake systems to underdrive pulleys. Click here to find out more about what bolt-on performance products can do for your vehicle. Your relationship with your vehicle is special. You want only the best performance modifications, and you want an engineered solution, not just bolt-on power. At Paul's Automotive and 4X4 we have been engineering custom performance solutions for our customers since 1981. This year brings the launch of our performance brand, Snell Family Racing. Do you want more performance and better fuel economy from your diesel-powered vehicle? Edge chips are the answer. Click here to find out more about Edge chips for your diesel. We have experience in engineering performance solutions for everything from 1963 Corvettes to Nissan Silvias. Check out one of our latest projects - a turbocharged 6.0 liter V8 in a Nissan S14. Not into imports? Check out our NHRA team. Don't like cars? Check out our twin-turbo Duramax-powered GMC project, The Big Ugly.